The Plug-In Tart Burner - Roses is perfect for kitchens and baths. 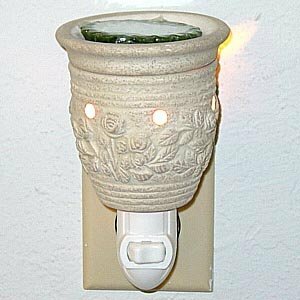 This unique burner can melt one standard size wax potpourri tart or smaller wax pieces. It plugs right into a socket without a cord and can also be used as a night light. Includes a removable wax bowl and a 15 watt appliance bulb. On/off toggle switch. Not recommended for areas accessible to children and pets. Approximate size 5" height and 3" diameter. Yankee Candle wax potpourri may work better in this item if broken into pieces first. This design has a stone finish and is unglazed except for the inside of the wax bowl. Wax not included. If you have any questions about this product by Levine Gifts, contact us by completing and submitting the form below. If you are looking for a specif part number, please include it with your message. Aspen wood Wands: Handcrafted from the native woods of Colorado. Lampe Berger Fragrance - Fruit Melody, 500ml/16.9 fl.oz.